Aliens. Did that catch your attention? 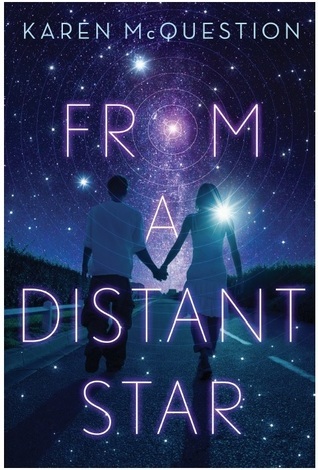 I’m a sucker for a good alien story, and was so, so pleased to find From a Distant Star on my reading list. And boy, this book is CUTE. I think that;s the best word to describe it! It’s a romance with barely any romance; an action story with only mild action; it’s a story of love, friendship, and a quest for home. And it’s so amazingly sweet. Lucas is dying of cancer. As he nears the end, the impossible happens. An alien crash lands in his yard and uses his body as host in order to troubleshoot a way off of this strange planet known as Earth. Emma, Lucas’s longtime girlfriend, knows right away that the man who came back from the brink of death was not the Lucas she knew and loved. It doesn’t take long for her to piece things together, and determine something has to be done: the alien must be sent home in order for her to get the love of her life back. Together, she and ‘Scout’, the alien who’s taken over Lucas’s body, must road trip to the one place they know must be able to help. But Scout’s arrival has not gone unnoticed: strange government agencies are on their tail, with nefarious plans for the alien being. Can Emma get Scout home in time, and bring her love back to life? The premise of this novel is awesome. For once, the aliens who visit us wish us no harm, searching only to communicate and befriend us. Scout tries to slip into Lucas’s life, to quietly observe rather than taking over and trying to run it himself. He only wants to understand and learn. I absolutely love this. I’m so tired of the earth-hating alien trope! As I said earlier, this novel is so cute, incredibly sweet. Scout and Emma form a bond you would not expect. They grow to respect each other, and even love each other, though platonically. They learn from each other and grow from their experiences. The plot itself is a little bit… simple? This is not a bad thing, no, but the threats never seem that threatening. Scout has a certain advantage that doesn’t leave much room for deceit, so there’s never any worry whether a character is anything but who they say they are. There are moments of action, fight scenes, car chases, even threats and capture, but there’s never any doubt about who’s going to end up on top. It’s unrealistic that so many people would be so selfless in helping Scout and Emma. Emma herself I actually feel divided about. On the one hand, she’s resourceful and smart, knows how to hold her own, and seems like a very believable characters. What seems less believable is her obsession with Lucas. It’s completely understandable that she’s in love, that she worships her boyfriend, but at times it was borderline terrifying. She mentions more than once that “other people can’t have him, he’s mine” (usually about classmates who find him very attractive, because he’s so hot) and that they both know they will be together forever (it’s been a year, and he’s been dying of cancer). While she manages to appear independent, there are hints of a co-dependent personality. She literally cannot live without Lucas. Which only seems to make the book more interesting, because Lucas himself only appears for tiny amounts of time, in Flashbacks and so on. It’s a love story where the main love interest is being possessed for 99% of the time (or playing host to an alien entity, which is pretty different). So while Emma’s rants about undying love can be pretty obnoxious, the lack of clingy romance balances things out. Scout himself is a fantastic character. He’s a non humanoid alien (huzzah!) who cares (sometimes called too sensitive) about people and just wants to learn and fit in. Sometimes he acts like a small child, other times like a wise old man, and always like an adorable alien who doesn’t know heads from tails on this strange planet. I would love to read more about him. All in all, while a simple plot, this novel had great premise and was a fun, fast read. I recommend it for fans of YA who want something fun to devour. CUTE ALIEN ROAD TRIP, YALL!